Recently we coined the term supercutaneous plating using a locking compression plate (LCP) as an external fixator. The use of this technique in peri-articular areas is facilitated by the development of anatomical plates with various screw sizes. 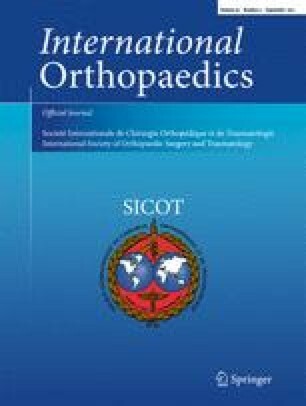 The purpose of this report is to describe our results using the metaphyseal locking plate (LCP) as an external fixator in the treatment of infected post-traumatic problems of the distal tibia. Between August 2008 and January 2012 a total of seven patients underwent external plating (“supercutaneous plating”) of the distal tibia using a metaphyseal locking plate. Average age was 43 years (range 20–79). Six out of seven patients had a documented infection at the time of external plate application. All patients in this cohort were followed prospectively at regular intervals by the senior author (PK). The plate was in situ for an average of 17.5 weeks (range 6–60). There were no clinically significant pin site infections. In four patients the plate was kept in place until there was complete consolidation. In three patients the external plate was exchanged for formal internal fixation once the infection had subsided. At the latest follow-up (average 12.8 months, range 4–31), all patients were fully weight bearing with a fully healed tibia. All patients were infection-free with well-healed wounds. Infection of the distal tibia after treatment of traumatic and post-traumatic problems is a challenging problem. It is common practice that after initial debridement and hardware removal, temporary bony stabilisation is provided by external fixation. Most external frames for the lower leg are bulky and cumbersome, causing significant problems for the patient. To circumvent these issues, we have successfully used an anatomically-contoured metaphyseal locking compression plate as external fixator in a series of seven patients for acute or post-traumatic problems of the tibia. The soft tissues around the ankle and distal tibia are easily compromised by trauma and subsequent operative fracture treatment [1, 2]. Salvage of these challenging problems more often than not requires a staged treatment based on thorough debridement(s), antibiotic treatment until infection is eliminated followed by reconstruction [3, 4, 5, 6, 7, 8, 9, 10]. The initial debridement should include removal of all failed hardware. The resulting instability will compromise the eradication of infection. To prevent this, temporary bony stabilisation can be obtained by some form of external fixation. However, most external frames for the lower leg are bulky and cumbersome for the patient, leading to problems with sleeping, clothing, and can cause an impediment to the contralateral extremity when walking. Previously, our department reported the use of a dynamic compression plate (DCP) as an external fixator [11, 12]. This involved placement of a nut on the undersurface of the DCP that turned the device into a fixed angle construction. As a modification of this technique, we introduced the standard locking compression plate (LCP, Synthes BV, Zeist, The Netherlands) as an external fixator, and coined the term supercutaneous plating . In this article, we report the successful use of the anatomically-contoured LCP metaphyseal plate as external fixation in seven adult patients for acute or chronic post-traumatic problems in the midshaft and distal tibia. Between August 2008 and January 2012 a total of seven patients underwent external plating (“supercutaneous plating”) of the distal tibia using a metaphyseal locking plate. In Table 1 the patient data are summarised. The indications for using external plating were five infected non-unions of the distal tibial and one chronic infection of the tibial shaft. One patient presented late (two weeks after injury) with an open distal tibial fracture and was treated with metaphyseal LCP external fixation as definitive fixation. Average age of the patients was 43 years (range 20–79). Six out of seven patients had a documented infection with known bacteria at the time of external plate application. For one patient there were no culture data but the wound had a purulent discharge. All platings were done by the senior author (PK); the free vascularised fibula was done by the plastic surgeon (SDR). All patients in this cohort were followed up prospectively at regular intervals by the senior author (PK). Radiographs were obtained at regular intervals at six weeks, 12 weeks, three months and six months and at final follow-up. With the patient under either general or regional anaesthesia, the involved limb is prepared and draped in the usual standard sterile fashion. No antibiotic treatment is given until deep tissue cultures are obtained. No tourniquet is used; this is to allow intravenous antibiotics to reach the infected area after deep cultures have been taken and to delineate nonvital from vital tissue. The infected area is approached through the old incision. Preoperative consultation with a plastic surgeon should be considered, especially if, at a subsequent stage, a tissue transfer (free vascularised flap or pedicled flap) is planned as part of the reconstructive efforts. A thorough debridement is performed after removal of all implants that do not provide mechanical stability. Knowledge of the exact type of hardware that is in place is essential to facilitate removal. This should not be taken lightly, as the hardware removal will otherwise be unnecessarily difficult and frustrating. Soft tissues are generally closed in one layer prior to placement of the LCP as external fixator as the plate might limit easy access for wound closure. Alignment and bony contact is optimised. Next, a LCP metaphyseal plate for the distal tibia (Synthes BV, Zeist, The Netherlands) of appropriate length is chosen. We recommend relatively long plates to increase the number of options for screw fixation. Also, mechanical stability increases by placing the LCP as close to the bone as possible, yet still allowing for some swelling, and by placement of points of fixation both far and near to the non-union. We only use locking screws that are predrilled with the appropriate size locking drill. Until biomechanical data are available for unicortical vs. bicortical fixation for this plate when used as an external fixator, we prefer bicortical locked screw fixation when we use this plate as an external fixator. For the distal tibia, we use at least three screws (4.5 mm) above and three to four screws (3.5 mm) distally. Once the wound is closed, the patient can shower after five days with the external fixator in place. Depending on the intrinsic stability of the reconstruction, we let the patient toe-touch or partially weight bear. The plate was in situ for an average of 17.5 weeks (range 6–60). In four patients the plate was left in place until full bony healing was obtained. In three patients the external plate was removed and replaced by formal internal plate (n = 2), or reamed intramedullary nail (n = 1) fixation. We did not see any significant pin tract infections or any loosening or failure of the hardware. The skin seems to tolerate the titanium screws well and even seems to “adhere” to the screw. At the latest follow-up at an average of 12.8 months (range 4–31), all patients were fully weight bearing with a well-healed tibia. All patients were free of infection without antibiotics with well-healed wounds (See Figs. 1 and 2 for representative cases (case 3 and case 2 respectively from Table 1)). Standard and circular external fixators for the distal tibia are often bulky and uncomfortable for the patient. Most patients also find them aesthetically unacceptable. External fixation with an anatomically shaped LCP metaphyseal plate as described herein imparts a much lower profile. We were the first to describe the use of LCP as external fixation . More recently others have reported similar experiences [14, 15, 16, 17]. The low profile external fixator plate is easily concealed under regular clothing, and there is much less tendency for the frame to strike the contralateral lower leg in the swing-through phase of either leg during ambulation. From the surgeon’s perspective, the multiple 3.5-mm locking holes distally provide many options for distal fixation, versus the more standard two large external fixator pins. Despite its low profile, external fixation with the metaphyseal LCP seems strong enough to withstand the forces acting on the distal tibia. A possible disadvantage is that its cost tends to be higher than a standard half-pin external fixator (although ring fixators or hybrid fixators are costly as well). Obviously, our group of patients is relatively small and the indications limited. However, the consistent positive results using this approach support our opinion such that we feel our described use of this plate is easy and very well tolerated by patients. In our hands it has indeed been a useful addition to the techniques used to address these challenging problems.